So I’ve played around with two Cisco Nexus 5672UP switches which will be in production soon but before that I wanted to see what it took to get enhanced vPC online. Along the way I was into some new territory as I never stood up vPC before, so in this post I have posted some things to keep in mind and running-config examples, all of which I hope is helpful for a reference. So when I was looking at configuration examples I noticed some confusion between a dual-homed FEX setup and an enhanced vPC setup, so I’ll try to clear the air. 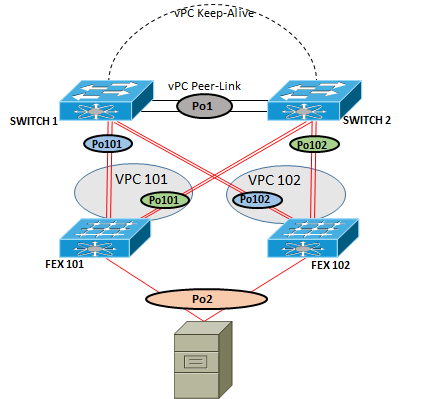 The “Enhanced” vPC is able to set up an etherchannel link from two different Nexus switches. The host/server that connects to these two different Nexus switches must support Active/Active NICs. This configuration is almost the same if you were setting up a dual-homed FEX but with just Active/Passive NICs setup on the host/server. So here is a question if the configuration is almost the same what needs to be added to support enhanced vPC? The software I am working with is version 7.0(1)N1(1) and we need to enable the features of vpc, fex and lacp. We need to start a VPC domain, this must be the same on both switches. A note about the peer-keepalive, the 5500/5600 Nexus has a dedicated management NIC card on the front of the unit. (Where the power is) The reason I did this was I did not want to waste a 10Gb connection for just a keep-alive link. (Although it can be done ) In this example I don’t have a “dedicated” management network so I decided to use the management NIC of both 5ks. By default you have a another vrf context called management on the 5ks running-config. So on both 5ks I give that vrf context an IP address and directly connected both 5ks together. Both switches are referring to port-channel one for interfaces 31 and 32. In the port-channel we will trunk the vlans we have created earlier along with setting this port-channel into a vpc peer-link. Here is the result, this is now an enhanced vPC. Some key points of this setup is be consistent with your configuration, it all has to match on both switches otherwise expect problems to arise. Enhanced vPC offers some high level redundancy, by just looking at the picture below you could have multiple failures and servers and applications would still be accessible. This makes this type of setup a common practice if business needs demand it. So I’ll stop it there like before I hope this information is helpful as a reference. Feel free to comment below if you have any questions. Thanks for pointing that out I fixed the image and thanks for the reference. Thanks for this, it was easy to follow up to get a working configuration. Thank you for this write up, great information. Yes you would be able to add 4 ports in a port-channel to the FEXes. You could almost do the same thing with two 5600s without the FEXes if you wanted. Just setup a VPC and port-channel on both 5600s instead of using the FEXes. What about using the QSFP ports instead of the Ethernet1/31 and Ethernet1/32 to connect both switches together using vPC, would that also work? Yes I would think that would work. However I don’t know if I would use the QSFP ports for a vPC link. Those type of ports would be better for uplinks. I don’t think you would be running that much traffic thorough a vPC link unless something is wrong. From what I looked at it seemed like you would want to balance it out. So for example if I had an uplink on 5k-1 to Core-1, I would also want an uplink on 5k-2 going to Core-1. That way the traffic does not need to go through the vPC unless there is a problem. Thanks, I found your post really helpful. I am in the process of implementing eVPC on 5672 UP. 1.You had mentioned that the host/server that connects to these different Fexes must support Active/Active NICs, does it mean that the host or server should support LACP? What if my host doesn’t support LACP? 3.Can I configure the fex port channel to static ( mode on) instead of active or lacp ? You don’t have to have Active/Active on the FEXs, you can have a single uplink from a host to a FEX and treat it like a standard port. The example that I showed is something you could do if you had a host that supported LACP. I also believe you can turn off LACP if you needed to and manually put up a port-channel on the FEX. Does this setup really need 8 network connections between the two nexus 5k and the two nexus 2k? Would it also work with only 4 network connections instead? and in that case would it still be called “dual homed”? I am not sure to understand the advantage of 8 network connections. You could use 4 connections instead of 8 you just loose the amount of bandwidth available instead of 40Gbps you would have 20Gbps that is available to the 2ks. It would also still be called a dual homed setup because that 2k switch is connected two different 5k switches. You are correct if you would have connected the server directly to the 5ks you have to specify a VPC or if you had a single FEX connected to the 5k. In this example however I’m using FEXes which already have a VPC configured from both 5ks and I’m using port-channels off of those FEXes this is called “Enhanced vPC”. There is a difference between them, when you create an Enhanced vPC you don’t specify a VPC on the FEXes because there is already a vPC created upstream.